The Council High School Biology Class recently completed studies of natural selection. In the lessons and the activity, the students learned how organisms have to adapt to their surroundings in order to survive. 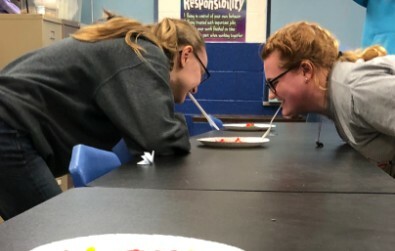 The students participated in an activity that required them to utilize a “bird beak.” The bird beaks included toothpicks, clothespins, and various plastic utensils. The students had two different food scenarios. 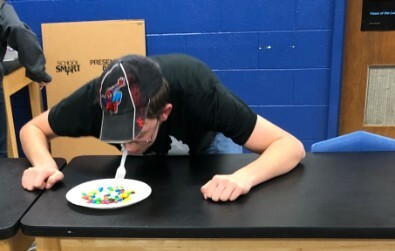 The first scenario required the students to “eat” gummy worms and Swedish fish. They had to not only pick up the food with their “bird beak” but they also had to make it to their “nest” without dropping the. Once at the nest, the students had to successfully put the food onto the “nest” without damaging it, the food, and the “beak.” They could not use their hands and could only carry one piece of food at a time. At the end of the first round, the bird species that had the lowest amount of food in their nest were not able to produce another generation and therefore became extinct. The group with the largest tally created a new generation. 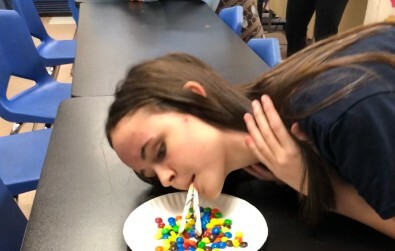 The students did this for two more rounds before the second scenario was introduced—a new food source (m&ms). Three rounds were carried out with the new food.